Recently, I played tourist and went to the Point-à-Callière Museum in Old Montreal to see the exhibit on Amazonia: The Shaman and the Mind of the Forest. I am always drawn to exhibits about South America and spent almost a year in Brazil in the late 1970s. In fact, I landed in Manaus and travelled by boat for four serene days along the Amazon River as it snaked its way to Belem. I say serene because the scenery hardly changed, continuous river with dense green jungle on both sides. Below is the late 19th century Manaus opera house, built with the wealth generated by the rubber barons. It closed with the crash in the early 20th century, but reopened in 1997 and now has its own philharmonic symphony. Since my first visit, I have travelled extensively in Latin America and feel a deep, mysterious affinity for it, so I was excited about seeing the Amazonia exhibition. On the first floor of the exhibit, many exquisitely beautiful artifacts were on display. 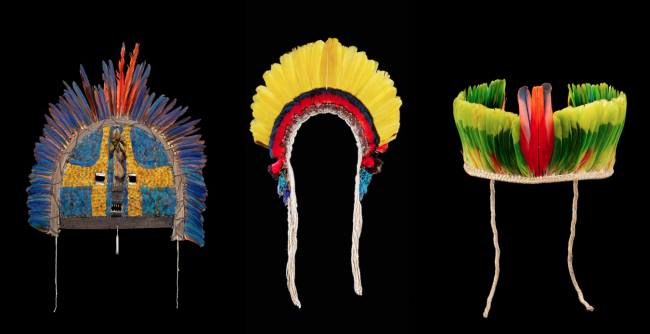 Pictured below are a mask and two diadems made from bird feathers. The photo is from the museum’s website. The artistry of some of the huge earthenware pots was also impressive. I am reminded of a comment made by a colleague years ago. I was at a conference in Rome, one of the great cultural centres of the western world, and she asked me if I was going anywhere else that summer. When I replied that I was going to visit a friend in New Mexico, she laughed at the contrast, saying there was no history there. Now that’s a good example of western hegemony at work because there are many traces of ancient history in the Southwest. 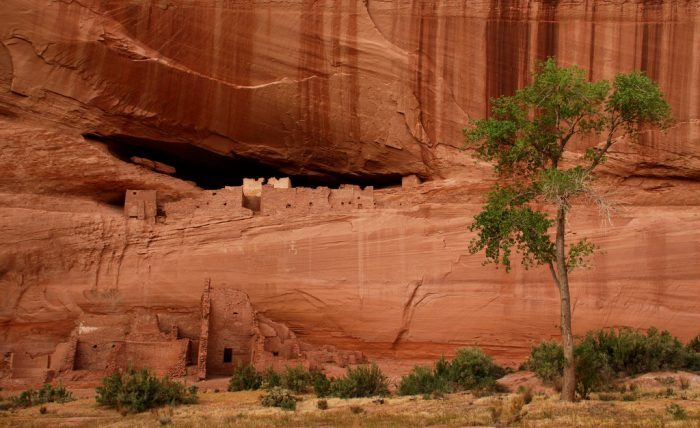 Below is a photo of the ancient cliff dwellings in the Canyon de Chelly in the Navajo Nation. There are also a distinct cultures. 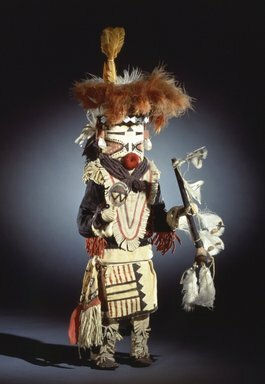 At the recent Chagall exhibit at the Montreal Museum of Fine Arts there was a Zuni Katchina doll on display to show the diverse sources that Chagall drew upon for inspiration for the modern ballet costumes he designed. Just this past winter I read the fascinating The Lost City of Z, written by David Grann, who also writes for The New Yorker. The book was recently adapted into a film and marketed as an Indiana Jones type adventure story, but it is based on an actual explorer, Perry Fawcett, who was convinced there was an ancient civilization buried within the Amazon rainforest. Well, in the twenty-first century he has finally been proven correct. Wikipedia, in their article, note that the pottery methods used by the ancient tribes are nearly identical to those used today. However, what drew me to the Amazonia exhibition was the emphasis on Shamanism, which has always fascinated me. I think the subtitle of the exhibition expresses the capacity of the shaman well. Through rituals and the ingestion of mind-altering natural substances, the shaman becomes one with the forest. It is a merging of consciousness. In a special issue of the magazine Tribal Art, Boris Wastiau, the Director of the Musée d’ethnographie de Genève, explains that the forest is “a conscious ecosystem from which [the shamans] are ontologically inseparable.” For those who have never felt the essential presence or consciousness of the natural world, this may seem strange, yet it is our alienation from the natural world that is leading to our demise. This is a tragedy that could be avoided. abolishing a vast reserve of tropical rain forest in what conservationists are calling the biggest attack on the Amazon of the last 50 years, the move ending protections for the Renca Reserve, a swath of rainforest the size of Denmark, paving the way for road building, mining, and logging. Indigenous tribes in the Amazon are fighting to preserve the Amazon rainforest, not only for their own survival, but for the survival of the planet. In terms of its size and biodiversity, the Amazon rainforest if the largest in the world. It is vital to our survival as it supplies 20% of the world’s oxygen. While I wrote this, Hurricane Harvey hit Texas. Hopefully more people will wake up to the reality of climate change and what is at stake. Hi Elaine. I very much enjoyed this–I am enjoying my friends’ blogs more than anything else these days, so I hope you will write more. This sounds like a great show. I learned in Costa Rica this summer how much they differentiate themselves from other Latin Americans, such as Nicaraguans and Mexicans, not as better or worse, but different–and they noted that their Spanish is different–different idioms. I know Costa Rica has preserved a huge amount of land–I feel sorry about Brazil, and as you say, hope more of us wake up to reality. Thanks for your comment, Diane. I’d like to add that just last Wednesday, 30 August, the Brazilian court blocked President Temer, saying he overstepped his authority. So there is hope. Brazil was colonized by the Portuguese, so they don’t speak Spanish, which varies from place to place. In Mexico they have some notable differences, esp. regarding the pronunciation of the V as B. It may be the American influence, but they sometimes leave it as V. Also, the lisp one finds in Spain does not exist in Latin America, which makes it easier to understand what is being said. I just read this now: the reply is John McPhee’s: you mean no written history. Of course there’s history everywhere. Temer has been put in place by the US and its corporate allies and the fate of many who fight them is imprisonment and/or death (especially journalists). I have no Spanish. I would have liked to see the cliff dwellings: they put me in mind of Willa Cather (whose fiction however is dismayingly colonialist and reactionary even if she romanticizes the Catholicism and native American landscape. There are many cliff dwellings in the South West and well worth visiting. As for Cather, in her Lost Lady there is a subtext that provides a critique of colonialism insofar as asserting that the land in the west was stolen by the government in order to build the railway. Which reminds me, I would like to reread her Death Comes for the Archbishop, a remarkable novel and a far cry from O! Pioneers. Actually, she meant no trace of history, which is a common assumption.